If you read the previous article then it is clear that chess has changed a lot. The usage of engines or more broadly electronics have heavily impacted our game. Surely not everybody is happy about this. I even have a strong suspicion that because of this some players have stopped playing chess as they lost interest. There exists a real danger that the creative side of the game is minimized. We are today very much dependent from those electronic aids. This dependence sometimes also creates silly situations if something goes suddenly wrong. Probably some readers will remember the transmission-error in the 10th game of the recent WC. Top-grandmaster Fabiano Caruana joked on twitter that maybe it was a try to give a few million viewers a collective heart-attack. 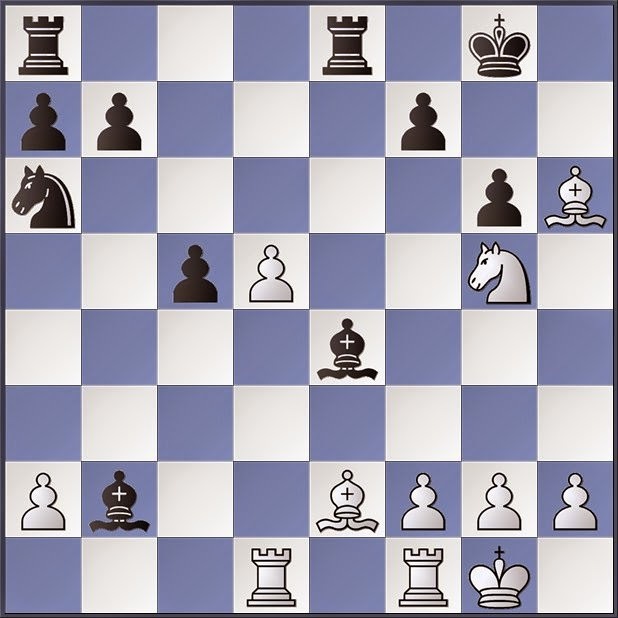 Anand - Calrsen: 19...Bxg2 ??? While this only lead to maximally some irritations, it becomes more painful when a technical error impacts the course of a game. Such thing happened in the recent game Karjakin - Caruana played in Baku for the fide grandprix. A transmission-error was the reason why Karjakin got very quickly already in timetrouble. In those top-tournaments players have access to rooms where they can get snacks or drinks. Karjakin relied as usual on the screens in those rooms to know when he had to move but he realized far too late that something went wrong. Later in huge timetrouble - 10 moves in 2 minutes without increment - Karjakin didn't manage anymore to scrutinize sufficiently the complications in initially a favorable position and lost nonetheless. Later on e.g. chess.com, several players asked why there was not an arbitrary time-correction in favor of Karjakin which compensates the transmission-error. Many considered the victory of Caruana as not sportsmanship. However arbiters aren't allowed to judge based on emotions but have to define who is liable. Of course I don't have access to the contracts of the top-players but I suppose that the screens in the rooms where players can rest, are only informative. I don't think it is possible as player to claim any compensation or to give notice of default. Some people also consider the behavior of Caruana as incorrect. If you executed your move then it is normal to warn the opponent that his clock is running. This is not only difficult or forbidden, see article 4.9 but can we really state that you aren't a gentleman when you don't warn the opponent? Is time not a crucial element of the game just like the pieces which we carefully move on the board? Anyway I notice that even for the most ordinary casual games a clock is installed which dictates the tempo and often has a large influence on the result. Accurately keeping track of the time (but also the recording as in the article the sadistic exam) is the full responsibility of the player. I won't hold back to profit from some negligence of my opponent. In 2 recent consecutive games my opponents forgot to press the clock. Well in such situations I will pretend to think very hard. We can be best friends off the board but in a game I don't give presents. However I do warn my opponent if I am completely winning and a running clock only prolongs the game unnecessary. In one of those 2 games, the one against Stijn Bertrem, something peculiar happened. While I had to move but his time was running, I took off my watch and put it next to the clock. I regularly do this as I don't like wearing a watch during a game. While thinking, I often put my hands against my head and at that moment I don't like to feel any pressure on my wrest from the watch (steel of about 100 gram). After putting the watch down, Stijn looked at it and at the same moment noticed that his clock was still running. In fact I gave him unintentionally a hint. The hint is nothing special but I do want to discuss the habit of putting the watch on the table during a game. I am aware this is a bit strange and I am careful that the watch isn't stolen but I am surely not the only one. Without doubt the most famous protagonist is former world-champion Garry Kasparov. It is a well-known anecdote that at the start of any game he puts his watch next to the board. When he puts the watch back on his arm then it is in most cases a signal for the opponent to resign. Somehow I think this is is logical as when you have a clearly won position then no further deep reflection is needed. So I don't believe Garry tries to play any psychological game. When 2 months ago Loek Van Wely in his Unive Chess festival of Hogeveen demanded the participants to wear some bands which would register their heart-beat and transmit the data then I really wondered who is that crazy to agree. In an official game you don't experiment but money seems to be a very good incentive. Even Jan Timman was persuaded. I may belong to the first generation having learnt to work with computers but some experiments and electronic aids are really not for me. I removed a comment as I had the feeling it was spam. If not then please explain the connection with the article.